A revolutionary 'Theory of Everything' based on a Unified Field Theory of Consciousness, The Awareness Principle offers a radically new philosophy of life, science and religion. 1. We assume that without a world of things there would be no aware beings and nothing to be aware of. It is the other way round. Without awareness as such there would be nothing - no thing, no beings and no world or universe to be aware of. 2. Awareness cannot - in principle - be a property or by-product of any body or being, thing or object, self or ‘subject’, ego or ‘I’ that we are aware of. 3. Awareness as such, and any thing we are aware of, are like space and objects in space. They are both inseparable and yet absolutely distinct. 4. Everything we are aware of has a localisable character – it can be localised in space. Awareness, like space, has an essentially non-local or ‘field’ character. Consciousness is 'focal' awareness. Awareness is non-local or 'field' consciousness. 5. Space has an inside but there can be nothing ‘outside’ space, just as there can be nothing 'before' or 'after' time. Similarly there can be nothing outside, before or after awareness. 6. Since there is nothing outside awareness, everything we are aware of exists within awareness, and can be nothing but a manifest form taken by awareness. 7. ‘Energy’ (Greek energein) is not a thing but the formative activity of awareness through which it actualises or gives shape to itself in everything we are aware of. 8. Consciousness is awareness 'of' things, rather than awareness as such. Since without awareness there would be nothing to be aware of, awareness is the pre-condition for all ‘conscious’ experiencing. 9. All sensory qualities that we are aware 'of' - colour, shape, texture etc. - are expressions of innate sensual qualities, shapes and textures of awareness as such. 10. Any manifest form (Greek morphe) of awareness is automatically stabilised through self-resonance with its reality as a potential pattern or quality of awareness. This is the true meaning and essence of the term "morphic resonance" (Rupert Sheldrake). 11. All shapes, patterns and qualities of awareness are essentially tonal shapes, patterns and qualities – like the qualities of warmth and coldness, hardness and softness, brightness or darkness etc. that belong to musical or vocal tones, and their patterning as sounds. 12. Being or existing is inconceivable without a primordial awareness of Being or of beings. This makes awareness as such a more primordial reality than either any being or Being as such. The very 'being' of awareness is itself a primordial awareness of being. 1. Awareness cannot - in principle - be reduced to the product or property of anything we are aware of. 2. Awarenessis not a product of the body or brain. How can it be, since bodies and brains have reality only in awareness? 3. Awareness is not bounded by our physical bodies. How can it be, since our awareness of the space around our bodies is nothing itself but a spatial field of awareness? 4. Awarenessis not the property of a localised ‘subject’, ‘self’, ‘ego’ or ‘I’ – How can it be, since all localised ‘subjects’ of awareness only know themselves as centres of a non-local space or ‘field’ of awareness? 5. Awarenessis not a blank sheet on which we receive impressions of an external sensory world. How can it be, since awareness has its own innate sensual qualities– such as the sensed light and darkness, levity and gravity, colour and tone of our moods, or the sensed density or diffuseness, clarity or dullness of our everyday consciousness? 6. Awarenessis immaterial, but it is nothing shapeless, disembodied or insubstantial. How can it be, since our own body is nothing but the sensed bodily shape and substantiality of our awareness? 7. Awarenessis not a product of energetic patterns or material forms, of genetic or molecular patterns or biological forms. How can it be, since pattern and form are themselves nothing material or energetic? You can no more pick up or hold the pattern of a molecule, cell or biological form than you can pick up or hold the pattern of a geometric form, the roundness of a circle or the squareness of a square. 8. Awarenessis not a pattern or form, but it forms or crystallises itself into patterns, just as it also flows in draughts and currents like air and water, mixes and merges in streams, radiates and ripples in and out like waves of energy, diffuses and densifies like matter. 9. Awareness does not require any energetic, material or ‘aetheric’ medium in which to take form or flow, radiate or ripple in waves, move or communicate. Awareness is the aether. 10. Awarenessdoes not require physical time or space or motion as its medium. How can it, since our very awareness of physical motion in space and time is preceded by motions of awareness, occurring in times and spaces of our awareness? The Olympic diver preparing to dive does not first move his body and thenbecome aware of this physical movement. On the contrary, the precise physical movement of his body in space and time is the expression of a precisely rehearsed inner motion of his bodily awareness as such. 11. Awarenessis not simply awareness of some localised object or ‘thing’that is already present - ‘out there’ or ‘in ourselves’ - thus enabling us to focus on it and reflect on it in thought. How can it be, since all things and all thoughts – all phenomena whatsoever that we experience - only come to presence within non-local spaces or fields of awareness? 12. Awarenessis not bound by our experience of phenomena – whether things or thoughts, percepts or concepts, sensations or emotions, drives or impulses. How can it be, since just as our awareness of an experienced object is notthat object, neither is our awareness of experiencing any phenomenon the same thing as that experienced phenomenon? 13. Awareness is not a relation of a localised subject to a localised object. How can it be, since all localised subjects or objects of awareness only arise within non-local fields of awareness? Objects are the outward form taken by innate field-patterns and field-qualities of awareness or subjectivity. 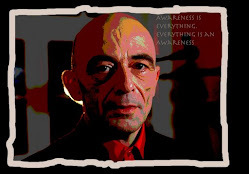 Awareness is itself a subjective field and field-pattern of awareness.‘Objects’ are but a medium of intersubjectivity - the perception of one‘consciousness’ or ‘subjectivity’ - one field-pattern of awareness -within the perceptual environment or patterned field of awareness of another. Who or What is the Experiencing Self?